McNeill Art Group has temporary quarters at the Hill Street Gallery this summer, and has opened the exhibit slate this past June with Stained with Sweet. The show includes a selection of works by Perry Burns, Tapp Francke, Jeff Muhs, and Bettina Werner. 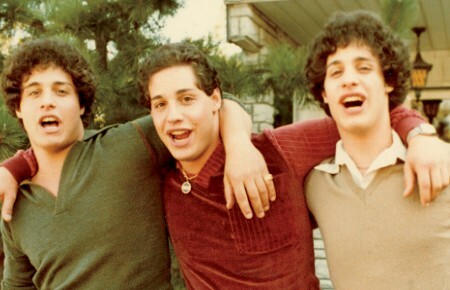 The first three have been staple artists affiliated with curator Beth McNeill from early on. In this show there is some revisiting of works and styles from the past decade, in addition to a visual and aesthetic journey through color and abstraction. Recently Perry Burns had turned to abstracted/pixelated socio-political imagery in mixed media on canvas, a shift from his earlier textured, swirling, curving, and spiraling non-objective abstractions. Here, Burns returns to elaborate oils on canvas whose layered and scraped-away surface abstraction is simplified and held together by the geometry of curvaceous line and form. Jeff Muhs revisits former work literally in the panel titled Wisdom, Faith, Truth & Orange (2014). 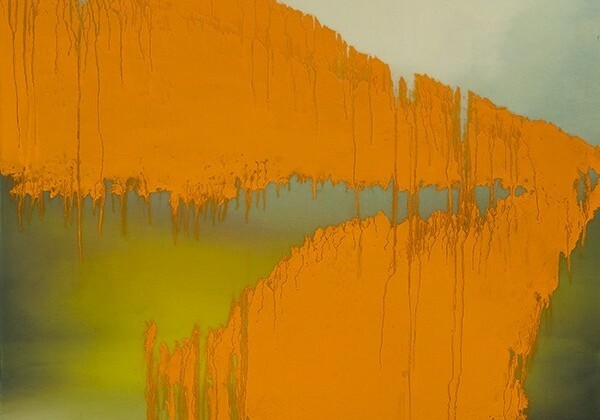 He completes one of his earlier, signature atmospheric oils with a bold, dripping swath of intense orange. A large oil on canvas, Blue Chip, continues this new direction with a similar stroke of turquoise blue on a gestural, partially whited out background. Three photographs from Tapp Francke’s familiar Lieonize series are interspersed amongst the selection, including the C-print Stained with Sweet that lends its name to the show. In addition to these photographic works wherein the artist captures neon light in extreme close-up, Francke has been exploring color and light (and our reactions to them) through neon tube light pieces that compose a single word or short phrases, of which Love Me is featured in the gallery window. The recognizable medium of “The Salt Queen”, or Bettina Werner, is present in six works by the artist who works exclusively with pigmented white salt crystal. Werner, who exhibited at the Hill Street Gallery last year, creates relief works that are textured and luminous and often saturated in intense hues. 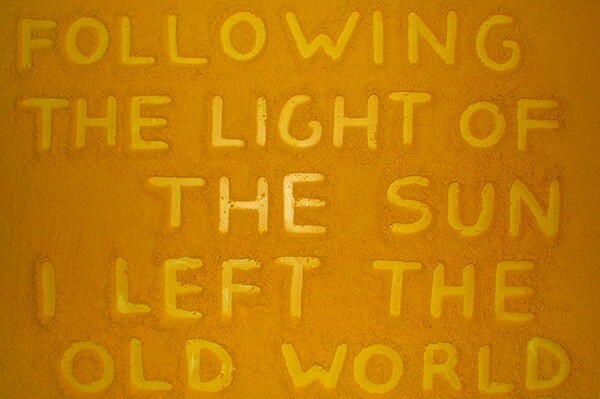 Following the Light of the Sun I left the Old World is a straightforward bright yellow work in which the artist has inscribed these words, seeming to allude to her Italian origins and how the Hamptons have become home and influence. The show is easy on the eyes, achieving aesthetic harmony and visual beauty, as was the goal of McNeill in curating it. The prominent conceptual challenge is introduced on one small wall where six signed and numbered copies of the limited edition book “For Which It Stands: Americana in Contemporary Art” are displayed, each with original cover art by Kevin Berlin, Jeremy Dean, Penny, and Peter Tunney, and graffiti artists D*Face and Zevs respectively. Published by The Curated Collection, the book is a 400-page hardcover curated by Carla Sakamoto. The covers are striking (extreme and anti-establishment even), as is the subject matter; the books so beautifully crafted and presented they still fit the sublime–sweet but not saccharine—theme of the show. The exhibition remains on view through July 13 2014 at 40 Hill Street in Southampton. Esperanza León was born in Caracas, Venezuela, and raised in East Hampton, New York. She obtained a Bachelor of Art in Art History at the University of Toronto then moved to Venezuela to pursue museum studies and develop cultural and visual arts projects while working in museums and theatres, until her return to East Hampton in 2000. Since 2001 she has directed Solar, dedicated to promoting art and design from Latin America. 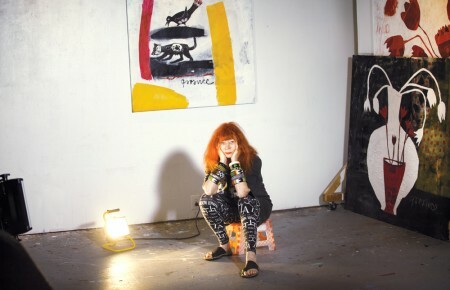 She has organized and curated more than 70 exhibitions and contributed to exhibition catalogues and written for publications such as The East Hampton Star, The Southampton Press, LI Pulse, and Hamptons Art Hub.